Anyone make their own ejuice? Why do you have ejuice discussion on a thc vape topic ?? @shroomgod, as the originator of this thread, I am pretty sure it is about making ejuice (hint: it's in the title ). It has traveled to other, interesting places as well. It's all good. I've learned a lot here. My favorites were extracts. It seems many others have learned some good stuff here as well. It always comes back around to topic again all on its own. Cmon man! Support the brother in his attempt to quit tobacco. It is the strongest addiction there is. I just figured it was a good place to ask about suppliers for bulk products to make ejuices, nicotine or cannabis. Don't worry about it @Eddie.saw, the thread is originally about making ejuice, albeit thc ejuice. Good luck with your efforts to quit smoking. Cigarettes and alcohol are both horribly difficult to quit. Thanks @Cobra50.... If I can stop using opiates, I can do this! These two I'm assuming are meant to be mixed together. The smaller bottle is a flavor concentrate. I used to make THC Juice for a friend to help her sleep. She tried the e-nail tonight. A very cool drip tip that is plastic >> metal. Hey bro, I moved your post over here to one that already tries to cover this topic. Hope you find what you are looking for. Probably one of the better ones available. Here's a review. 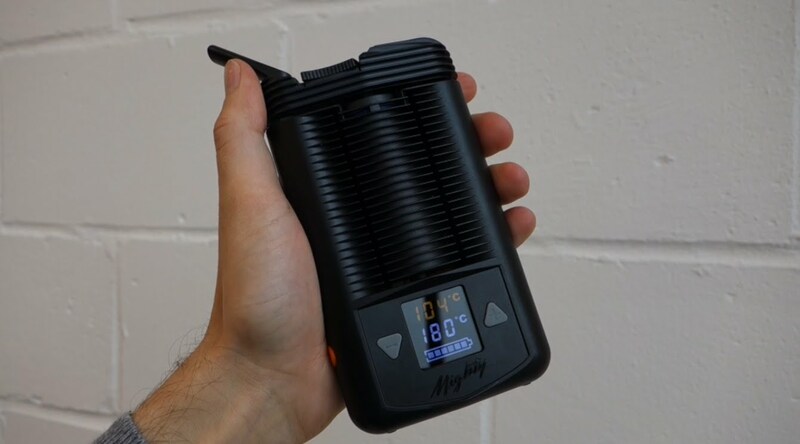 The Volcano Mighty Vaporizer is a sturdy portable vaporizer made for dry herbs and waxy oil. The construction is sound and the unit heats in under a minute. I use this lil guy with the Rosin...gives a scary big rip that will take your breath away. That was a cool article..makes sense why the stuff i made yesterday was darker...it's much older. Ive never gotten anything as light as their stuff...but i only have 6 months experience with rosin. I love the fact it's solvent less and retains so much of the flower. I would like to try the xl plus. The big advantage i see is the magnetic lid. Threading it on can often be challenging. I can't imagine having 4 coils though, it gives a monster rip with two. I actually like using the NYX head on the yocan bottom. It has two coils but seems to be lower temp. Hit taste better and is plenty big enough. I'm not sure what her whole airflow issue was but the plus doesn't have an airflow option but once again theres plenty of air. That button on the side of the NyX is a carb...nice but not Really needed. I think the best thing to do with the two coils is to pulse the button five seconds for each rip, any longer imho and its too hot and too much. 4 coils doesn't really mean hotter, it just means more even heat distribution... for example... I can run 1 coil at 20 watts, or run 2 coils at about 30 watts... you get about the same heat, but it's more evenly distributed on the 2 coils.. almost like growroom lighting if you think about it. That being said... I usually only run 2 coils, even when I could run 4, 8, or even 12 coils simply because more coils = more energy loss over time, so I use my battery up quicker. the plus xl has a turnable airflow adjuster... the issue was hers seems to be sticking probably because she didn't loosen it before she started vaping. Edit to add: if i recall correctly, the nyx had issues with the side button popping off.